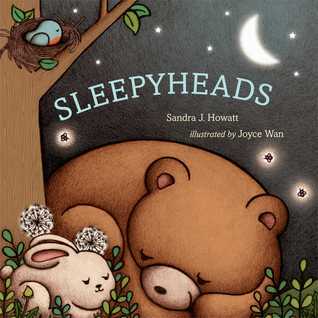 Sleepyheads by Sandra J. Howatt and illustrated by Joyce Wan | What is ML Reading? It’s not often I wish ML was three years old again. Don’t believe anyone when they say it’s the terrible twos. ML’s third year was the most challenging. Many of my friends experienced the same thing when they had a three year-old. I call it the first adolescence. When Sleepyheads by Sandra J. Howatt and illustrated by Joyce Wan arrived at the library, I found myself wishing ML was three for one night. So many books about bedtime are saccharine with similar story lines and illustrations. Not this one. Simple, original rhyming text and muted illustrations of animals hiding where they sleep abound. I buy books for baby showers. This one will be purchased for the next friend who has a baby. Any takers? This entry was posted in Picture Book and tagged Joyce Wan, Sandra J. Howatt, Sleepyheads by mlreads. Bookmark the permalink.